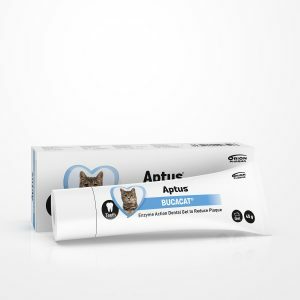 Daily moisturizing care developed for dogs and cats with dry, irritated skin. Easy to apply gel with several skin conditioning agents provides moisture and instant, soothing relief. 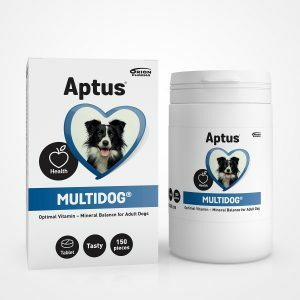 Recommended for regular use for pets with dry skin problems to support and restore the natural skin barrier function. Moisturizer for dogs and cats. Massage gently on irritated areas. Do not rinse off. Licking the product will not harm your pet, although for best results allow the gel to absorb undisturbed for a couple of minutes. Use daily or according to your veterinarian’s advice. Aptus Derma Care Moisturizing Gel can be used whenever needed, both regularly or for shorter periods. Please be aware that when damaged, restoring your pet’s natural skin barrier function might take weeks. Wash eyes thoroughly with water if exposed. Aqua, Sodium Lactate, Urea, Polidocanol/Laureth-9, Butylene Glycol, Glycerin, Panthenol, Ethyl Lauroyl Arginate HCl, Polyquaternium-10, Caprylyl Glycol, Piroctone olamine, Sodium Acetate, Sodium Chloride, Isopropyl alcohol. Dry, sensitive skin is itchy and irritable. This is often due to damaged skin barrier function. A weak, damaged skin barrier can lead to skin problems such as itching, flaking, and redness. Aptus Derma Care Moisturizing Gel supports and restores the skin barrier function with several moisturizing and skin conditioning agents: carbamide (urea), glycerine, panthenol, and lactic acid. Healthy skin with natural skin barrier function prevents skin problems. Aptus Derma Care line consists of three products: Derma Care Soft Wash, Derma Care Moisturizing Gel, and Derma Care Concentrate. 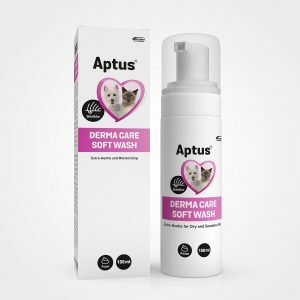 For best results, use Aptus Derma Care Soft Wash for bathing your pet. Derma Care Moisturizing Gel is a moisturizer suitable for daily use. Aptus Derma Care Concentrate contains zinc and is recommended to be used for 2 – 4 weeks on irritated areas. Always follow your vet’s advice.